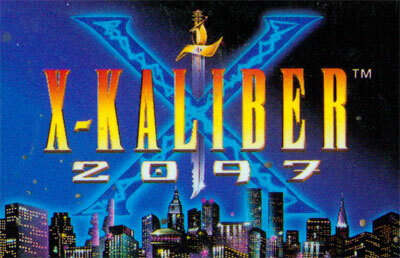 The game takes place in the year 2097 A.D. in NEO N.Y. The city is run down and controlled by a warlord named Raptor. Raptor has unleashed an army of ruthless, mutating Morphs upon the city to enforce his brand of order. Only two special forces agents, Slash and Alix do not submit to Raptor's will. Raptor decides to hatch a plan to kidnap Alix, so Slash, and more importantly his magic X-Kaliber sword, will come to him in an attempt to try and rescue her. The game consists of two modes. The first modes gameplay consists of side-scrolling action. The player can jump and swing a sword at enemies. The player can also deflect projectiles with the sword. The game also features one on one boss fights that are set up similar to a fighting game. The second mode is a two player duel that is set up like the one on one boss fights but is between two human controlled players.